Now 59 years old, Len lives in Biddick in the Washington Central ward. He is married to Sandra and has three daughters. He works as an Analytical Technician at Durham University. Len’s political background has been mainly through trade unions. He has been a branch official for UNITE for 35 years and branch secretary at Durham for the last 25. He is a sitting councillor for Washington Central Ward, and is currently chair of the Washington Area Committee. He has lived in Washington Central ward for 35 years and has enjoyed meeting and representing the people of the ward since being first elected in 2011. Len believes in the Labour principles of prosperity for all and not the few, an excellence in education, a well-funded NHS and an active community based local area. 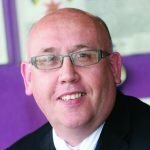 He is a school governor at Biddick Primary School and would respectfully like to ask for your support to represent you as a councillor in Washington Central for a further term.